Recent release “Miracles Happen Every Day,” from Page Publishing author Juanita Washington, is both entertaining and emotional; this work tells a story about a young lady growing up and realizing the hardships, pain and happiness of love and life. Juanita Washington, a mother, teacher, devoted writer and author, has completed her new book “Miracles Happen Every Day”: a passionately crafted work that portrays the beauty of life and self-worth. Published by New York City-based Page Publishing, Juanita Washington’s prolific work explores the ideas of personal identity, love and fate. Nitra was starting over, she decided to move to Arizona from Illinois to make a change. She was not happy with the way things had been going. She graduated out of high school five years ago and was dating a man name Gary for almost a year, until she found out he was married. How could she have been so blind? He never showed up on his off days like he said he would, he only came by to see her after work. They never had a real date he always had an excuse that just didn’t add up, something always came up. At least that was his reason for not showing up for the date he made plans for in the first place. Nitra soon found herself in a relationship with a man she would have never thought she would have. If she had not worked late and missed her bus, that miracle of a chance might not have happened. Terrance was more than she bargained for. She was not even considering dating for a long time. He was the type of man women in high society date not women like her. Not only that, she had never thought of dating outside of her race. Now she has what most women dream of, married to a man with a good career, graduated from college with a master’s degree, a beautiful daughter and her own business. Miracles do happen every day. 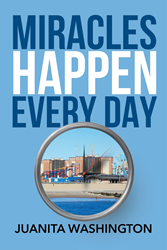 Readers who wish to experience this inspiring work can purchase“Miracles Happen Every Day” at bookstores everywhere, or online at the Apple iTunes store, Amazon, Google Play or Barnes and Noble.